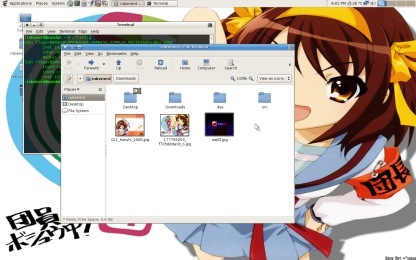 Rubenerd: KDE user tries Gnome after 8 years! KDE user tries Gnome after 8 years! Since as long as I can remember [the time after the accident], I've been a KDE and Xfce user on Linux, and later FreeBSD. From what I can tell from the CDs in my folders from that period my first exposure to FLOSS was the now defunct Red Hat Linux back in the 90's; and I remember feeling more comfortable navigating KDE than the default Gnome. Purple monkey dishwasher. As a long time KDE user one of the first things I noticed about Gnome was the general lack of clutter in the menus. KDE lets you customise anything, and it doesn't try to hide the fact. Gnome by comparison seems to only make the most common commands visible and makes you use Regedit-isque programs like the Gnome Configuration Editor to change the nitty gritty details. I'm torn over which methadology I prefer; there is something to be said about changing everything you want, but it also seems a tad redundant to have all these options available when often you'll only be changing them once to your tastes, then leaving them alone. I really hate to say it, but it seemed more reliable than KDE. Sometimes programs in KDE for no reason would exit and give me the colorful exploding bomb image saying the program quit unexpectedly, but I have yet to have a program quit on me in Gnome. Touch wood ;). In terms of bundled applications, I am a fan of *NIX Desktop Environments because they come with everything out of the box , so I don't have to worry about installing and constantly maintaining disparate packages just to get basic desktop functionality. In that regard a default Gnome install is somewhat leaner than a default KDE install; it seems Gnome is more selective but still bundles everything you need. Unlike Konqueror though Nautilus can't web browse, though Epiphany fills the gap pretty nicely. The advantage with Ephiphany being powered by Gecko is that more websites seem to like it. I was initally turned off by the Internet Explorer 6-ish toolbar layout, but a quick toolbar reshuffle by moving the address bar up to the same level as the buttons and removing all but the Back, Forward, Refesh and Stop buttons brought it closer to what I like. I use del.icio.us for bookmarking, but if I were to use local bookmarks I'm sure I'd appreciate the use of Categories to sort links instead of rigid folders. Seems everything is moving to categories and tags thesedays. So am I a Gnome convert? I'm not sure; if anything now I'm more confused than I am before over which I prefer! 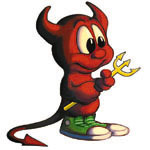 I guess that's the real beauty of open source software; as a FreeBSD user (or a Linux user) I'm not forced to use any one environment. Windows Vista “Yawn”, Xfce 4.4.0 is out! 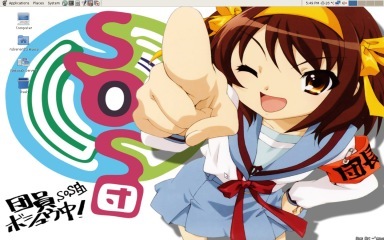 Haruhi Suzumiya dancing on KDE and FreeBSD? Newer post ← Don’t look now!